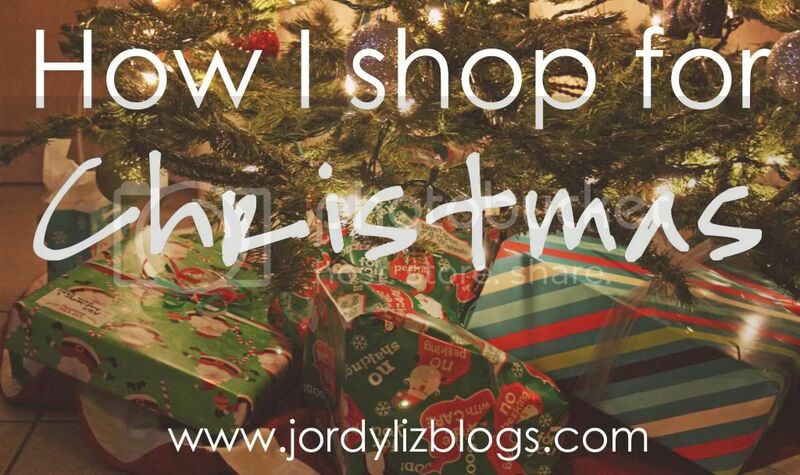 Jordy Liz Blogs: How I shop for Christmas. How I shop for Christmas. Christmas shopping used to be quick and simple: my mom, dad, sister, brother, a few friends and done. Since Chris and I got married a few years ago, fifteen people have been added to my family tree with eight of them being nieces and nephews ten years old and under. I've had to figure out a way for us to shop for Christmas gifts for a lot of people with a reasonable budget and little stress. 1. First, we make a list. Which family members are we shopping for this year? Sometimes the couples on his side of the family exchange gifts and sometimes we don't. We figure this out early on to determine our budget. The kids always get small gifts from us regardless, but eight kids still adds up quick. 2. Then, we make a budget. We try to keep it fair and reasonable. We spend the same amount on my parents and his mom, and we spend the same on each of the nieces and nephews. We spend a bit more on my sister and brother since they're younger, single and kid-less. We add it all up and know exactly what needs to be put aside to make it happen. 3. I shop throughout the year. This is one of my best tricks that keeps me the most sane. I start looking for gifts for the next year immediately following Christmas. I found a great deal online this past March at one of my favorite outlet stores. I stocked up on a few gifts and was done with three people in just minutes! I stick them in my gift storage area and move on. I also keep up with discount sites and deals such as GroopDealz and Pick Your Plum. There are so many cute, custom and unique gifts out there. 4. As it gets closer to the season, we spread out our shopping trips. To make it enjoyable for the both of us (because I could get it all done in one day and be happy), we spread out the trips. Before this last Thanksgiving, we knocked out the gifts for all of our nieces and nephews with a one-hour spree to Target. We grabbed a coffee beforehand and I made sure to involve Chris in all of the decisions (even though I had gathered ideas from the moms). I shopped for a few gifts online one day and then we went and shopped for our parents together as an afternoon date. By spreading it out, he doesn't get overwhelmed (both with shopping and financially) and that means it is more enjoyable for me, too. 5. I make sure we're done with a couple of weeks to spare. Personally, I like to be done with shopping early enough so I can enjoy the wrapped gifts under the tree, not get tangled up in the hustle and bustle of the stores, and sit back and enjoy the weeks leading up to Christmas. What are your tricks for making holiday shopping fun and memorable? Don't forget to download the Christmas Budget & Gift List!